Would You Read It Wednesday – The Tenth Pitch! The results are in! Although the showing was a little disappointing (a mere 13 votes when I had hoped for more like 100 to make it really official) the clear winner in the Would You Read It Official Snack Poll was Something Chocolate. Since, technically, chocolate donuts qualify for this category, I am happy 🙂 I’m pretty sure you Something Cereal folks can eat Count Chocula, and the Something Salty folks can eat their Pringles with chocolate milk (OK, yuck, but you get my meaning :)) With a little ingenuity, anything can qualify as Something Chocolate! Melody, Katheryn, Stina – You're right about that line. It was tough to figure out how to phrase it and obviously I need to do more work on it. Thanks for the heads up, I'll give it some more thought! Jess, Kim, Randy, Melody, Kathryn, Natasha, Erin, Stina, and Dee – thank you all so much for your helpful comments to Aimee! Stina – glad you like the clock! Yes, I would read this, but I want to know what she faces – boyfriends, careers, death? I am curious. After reading through the comments and gaining understanding about the “herself-in-twelve-years,” I would read this. Clar and Carla – I know! 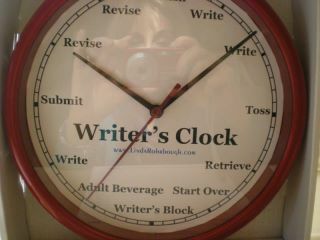 How fun is that clock?! Phyllis, Ms. Saba, Clar, Jenny and Carla – thanks for your thoughts on the pitch! I like that it combines (or sounds as if it does) the ability to “see” yourself when your older and see if you actually like yourself then (is your older self someone that you really want to take advice from) with talking to your younger self whom at that point in your life you probably think is just a stupid kid. I can't imagine getting along with myself at any age. I'll have to go with “maybe,” because I'm not sure what the story really is about. But I'm a sucker for time travel and the recesses of the human mind, so you had me hooked with those premises. Michelle and Cally – thanks for commenting! I do have to agree with Melody about reading it twice before understanding the “herself in 12 years” part.